At the beginning of 2014, I wrote an article reviewing 2013 and setting out my business ambitions for the year. I wrote it firstly as a planning and review mechanism for myself; secondly, on basis that it might be useful for anyone in the same boat; and finally, to highlight issues that have to be managed by self employed professional service providers in Ireland. This year’s article on business in 2014 is an update with some thoughts on the business model of operating as a freelancer in Ireland. The level of activity has remained pretty constant over the last 2 years – I can easily manage my diary using Google Calendar. My diary is on my phone and laptop. I am generally only booked up one week in advance. So I might not know what exactly I will be doing in 2 weeks time or who I will be meeting but experience suggests that by the time it comes around, I will have plenty to do. Long may it continue but such an outlook on life may not be for everyone. As you probably know, I work from home (and the car) – a topic I discussed in this Tweak your Biz article. I love my job! The level of challenge and the opportunity to add value for my customers (I suppose to be liked by them) is the primary reason for doing what I do. As long as I am continuing to learn I think I will be happy in my current role. That being said, the financial model often leaves me feeling like I am on a treadmill rather than hitting the open road. Overall, business has remained stable and relatively busy. As a single consultant business one wants a manageable and consistent pipeline rather than significant growth each year with peaks and troughs during the year. Invoices issued in 2014 increased from 43 to 49. I had 26 separate customers. Of these 12 were new customers that I had not worked with previously. Turnover increased in value by 15%. [I aim to charge fees which are reasonable and equitable to all parties. Once agreed, money is not an issue for me after that]. Training amounted to 40% with other work being consultancy and mentoring being 60%. 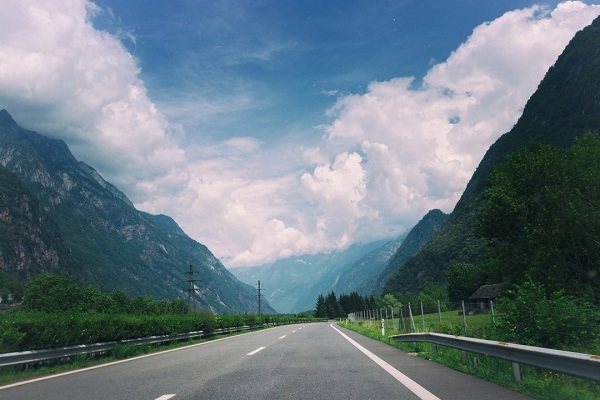 Miles traveled during year increased to 21,800 up from 19,000 but the percentage accounted for by business remained the same at 73%. The number of evenings worked/ home late, overnights and weekends worked increased only slightly last year. This was a serious issue in 2012 when it affected work life balance. I fixed the issue in 2013. I made a conscious decision not to seek projects that required me to work in the evening and this remains my general approach. I was surprised to figure out that my Twitter followers have doubled over the year admittedly from a low base. From 240 to 480 – without any extra special effort. Didn’t check LinkedIn as have over 500 connections anyways and I don’t focus on Facebook for my own business promotion. And I have not looked at Google Analytics in ages. 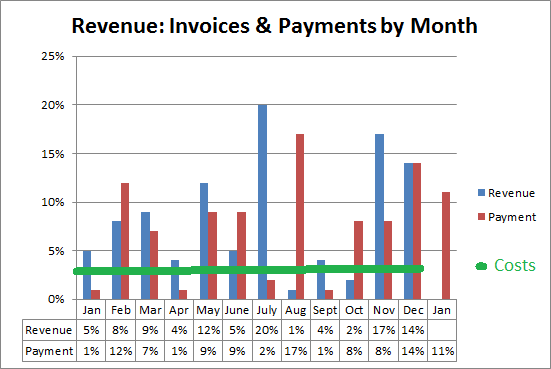 The good news is that 100% of revenue invoiced in 2014 has or will be received. This is similar to 2013. As such there are no bad debts – those would be very hard to take. • Potential client makes contact early June. • Work starts in July. Three days on site over several weeks. • Invoice issued in July. • Payment in mid October. This 4 to 5 month turnaround in the Sales cycle is not untypical and can be even longer. I have been talking to one potential client for nearly 18 months. I should really kick this one to touch but I think it is worth hanging in there! I also realise that I am lucky that I do not have to spend money on marketing as I get enough qualified inquiries from Word of Mouth, the website and repeat business. Most businesses have to add a few months and invest money to kickstart the Sales cycle. The impact on the business is a Sales and Cashflow pipeline that is unpredictable and not particularly consistent (but has worked out ok over the longer term!). And I would consider that I have a ‘nice decent’ base of customers who pay as promptly as they can. • Quick, and less expensive (to the customer) assignments that result in prompt payment. • More involved and longer duration, and more expensive in total to the client, where a hit has to be taken on payment. • Subcontract work that is regular and predictable in nature – I had kinda resolved to forego this in 2014 but it is difficult to refuse when asked and now I can see the merit from a cash flow perspective. I am also thinking that I am quick to offer a reduced day rate for projects of multiple days. Maybe this will have to change. Some customers facilitate stage payments i.e. split the project into two invoices. I have not pushed this option to date but will have to consider it more going forward. Unfortunately, I have not been able to attract clients who pay annual retainers. The truth is that it is not something that I have offered. The result is that one has to keep a very close eye on the bank balance to ensure that all outgoings can be met. I like to keep funds to cover 2 to 3 months costs in the account. I remember talking to another consultant recently and he said that the only day he missed his previous career was the 26th of the month – PayDay! Costs are now fairly predictable. In 2014 the business had 269 receipts compared to 207 in 2013. It is not an expensive business to run. Graphically, overheads could be represented by another fairly straight line that runs at approximately 3% of annual turnover on a monthly basis. Costs reduced from 30% of turnover in 2013 to around 25% of turnover in 2014. Except for some annual bills like insurance and car maintenance, there is a somewhat fixed monthly overhead mainly accounted for by travel and office expenses to include mobile phone. Obviously, busier periods such as March, April, Oct and November have a higher cost profile but only marginally. The normal payment cycle (from invoice presentation to payment) is reflected in model above. It probably follows follows Pareto’s principle. I would guessimate that: 10% of customers pay me that day or within a week; 80% pay within 2 to 4 weeks; and the final 10% take longer. I have been asked if I have standard payment terms. I suppose the answer is no as it is not mentioned on invoices – but implicitly I understand it to be payment on receipt of the email (all invoices sent electronically). I would regard getting the PO and early dispatch of the invoice, and not to wait till the end of the month, so that you meet the cheque or payment run is more important. As a sole trader there is no ‘profit’ in the business per se with any ‘surplus’ paid as salary to me (or drawings) when cashflow allows. • The cost figure of €22.64 is indicative of what it might on average cost to deliver a €100 service with the precise figure selected for ease of computation. • The figure for effective tax rate was also selected for ease of computation in this illustration. The effective tax rate includes allowances, PAYE and USC. This example highlights that 40% of the total fee invoiced is ‘paid’ to the contractor – not overly generous when one factors in delays in receiving payment. The contribution to the government is €37.36 by way of PAYE and VAT. 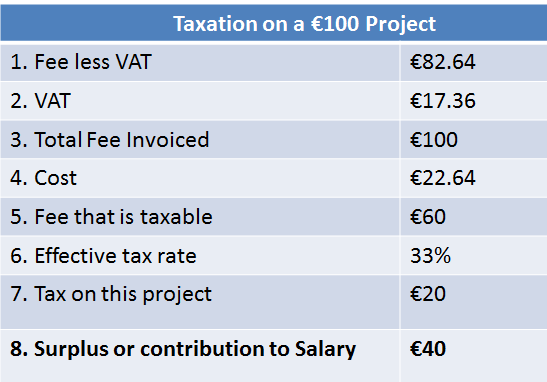 The effective tax rate for self employed contractors is much higher as total revenue increases and I think it reaches 55% when revenue exceeds €100,000. That would be a serious disincentive to taking on more work (risk and stress). I am not even going to think about how much of the 15% additional top line income generated in 2014 will actually end up in my pocket. By registering for VAT, my prices notionally increased but as my clients are predominantly VAT registered they are not adversely affected. The administration of VAT is not too onerous and as my input costs to include any capital purchases are reduced, VAT is on the whole beneficial (Don’t get me wrong – I end up collecting thousands on behalf of Revenue every year but it is never really my money). ROS – Revenue Online – is a very easy system to use for VAT and paying income tax (self assessment). I received my tax clearance within a week in October. Granted I could not use the online tool as it did not recognise my PPS number but the form in the post did the job! Public sector organisations charge 20% withholding tax on consultancy. I think that when a provider has a clear record, say 2 years prompt payment of taxes, that they should be exempted from Withholding Tax. In 2013, almost 25% of my tax liability was already taken in Withholding tax. Self employed contactors have to pay 100% of the tax liability for the year in October – easiest to calculate at 100% of the amount paid in the previous year. In the first year of business, no tax is paid but it is liable in the October after the end of the year. That is an advantage but as one is also liable for preliminary tax for the second year, one is faced with a huge bill of two years. We got over that and all my savings are gone. But it remains problematic. – By October of the year, I will have invoiced maybe 70% of my income for the year. I will have received about 65% in payments. Yet I have to pay 100% of the tax. This could be between 30 and 50% of all income (depending on effective rate – mine is high as I have signed all my allowances to my spouse as she has a regular job and salary). So for the first nine months of the year, you have to ensure that enough money is put aside to cover this liability – it could be half of all income received in the period. At the same time one has to take out costs and try to pay oneself. And the real killer problem is the WST as that is not supposed to be included in the calculation of Preliminary Tax. What this means is that you forced to ‘overpay’ tax and are required to make an early Tax Return the following year to claim a refund. Ok, it is still money that you will get back and pretty quickly in my experience but I prefer to have it in my own bank account. It is another delay which the system dictates as to when you get your financial reward for work done! Have I a solution to this dilemma? Not really. Accountants might suggest that I set up a Direct Debit to pay a regular amount in which case Preliminary tax is avoided. But my business does not have consistent revenue streams and a monthly payment would add more stress. At least now I just have to worry about it once a year – even if I have to start planning for it on January 1st. One could also consider setting up a company rather than operating as a Sole Trader but I am not sure how this would alleviate this situation. Personally, I would to see Preliminary Tax moved with the return date in early January with immediate payment required and any adjustments by the end of say March. Indeed, I would have no problem making two online returns per year. It is very easy to do with ROS. In 2015, when I was paying my preliminary tax, I contacted Revenue in Galway about WST. One has to retain all the individual F45 Certificates (Withholding Tax From Payments for Professional Services) received from the finance departments of the public bodies invoiced. I sent all the F45s to Revenue in September. They then credited these to my account and the figure for preliminary tax payment was reduced accordingly. Most of my posts are more positive but I like undertaking analysis so this post has been somewhat therapeutic. There is a lot of detail and I hope it provided some insight and value. As always comments welcome. Excellent article, inspirational for someone considering taking the self-employed plunge in the next year or two.